"The New Kid" was the seventh episode of the second season of Daria (episode number 207). It first aired on MTV on March 29, 1998. "The New Kid" was written by Sam Johnson and Chris Marcil. At Lawndale High, Jodie convinces Daria to try to join the yearbook committee by suggesting she maneuvers her parents into bribing her. Daria does just that, asking her parents for a new computer software. The next day, at the yearbook committee, Daria is approached by Ted DeWitt-Clinton, who surprises her by complementing her pictures and recognizing sarcasm. They bond during the following days as they talk about photography and literature. Ted reveals he had been homeschooled until that year. However, their quiet time at the yearbook ends when Ted convinces DeMartino to assign pages reserved for sports and clubs to other initiatives, despite the protests from other students. Daria and Ted are singled out as the authors of this motion. Daria ends up being accosted by Kevin and Brittany, whose pathetic attempts at intimidation end up revealing some secrets. Quinn also tries to convince her to give back the pages, assuming mistakenly that Daria is going out with Ted. A later visit by Daria to Ted’s house reveals that the DeWitt-Clintons plant their own food, generate their own power, build their own furniture and are weary of new technology. However, she feels overwhelmed by Ted’s behavior and personality and refuses a beautiful necklace he had made for her, though she feels bad about it and has to be consoled by Jane. The next day at school, after talking to Jane, Daria apologizes to Ted for the refused present and offers make to him by inviting him out for pizza. However, Ted is now the one who rejects her, claiming she reminds her of Quinn, a statement that shocks Daria. Her visit to Ted’s (and the fact she has given Ted some gum) prompts furious Leslie DeWitt and Grant Clinton to visit the Morgendorffers and demand Daria stops seeing their son. Jake and Helen are too surprised about their strange beliefs and attitude to be intimidated. However, their visit leaves them worried and they try to extract information from their daughters. Quinn only offers vague rumors about Ted being a freak. Daria offers her opinion they are all overreacting, insisting they’re not dating. Unconvinced, Helen and Jake bribe Quinn to hook her sister up with someone. So, that evening, Quinn convinces Daria to double date with her, providing Robert as Daria’s date to her Shawn. 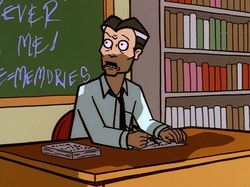 As he tries to make conversation by reading cue cards, Daria goes along until he breaches the subject of returning the yearbook pages, at which point Daria breaks the date and returns home. The next day at the yearbook, the Fashion Club, plus Kevin and Brittany, try again to convince DeMartino to return the pages taken from clubs and sports. However, Ted intervenes and is able to send the whole group away, first by loudly announcing an (nonexistent) sale at Cashman's and then by applying a joint lock on Kevin, making him retreat in pain. This so impresses Daria that she convinces him to take him out for pizza. That evening, the two teenagers go out and tentatively reveal they like each other. Things go wrong, however, when they enter a medieval world simulator in the video arcade. Daria feels sick in the virtual world and quickly leaves, but Ted is joined in the VR by Robert and some friends. They try at first to harass them, but quickly change their minds as Ted first defeats them in a sword fight and then leads them in adventures in the virtual world. The results of the night’s events are soon revealed the next day: Ted has apparently forgotten Daria and is now hanging out with Robert and the others. After she and Jane lament the missed date, Daria is informed by a terrified DeMartino that the yearbook pages had been returned to clubs (a decision caused by a trashing he had received by a psychotic Janet Barch). At home, Daria laments these events and is further incensed to learn her promised software had been given to Quinn, who had already used it to set up a web site. Visiting her sister at her room, she makes small talk before extracting her revenge on Quinn. Quinn's cover story for the double date is "I know this cute guy who's got a huge crush on you". Daria immediately assumes this is a trick and Quinn comes up with a different cover. Ouch. 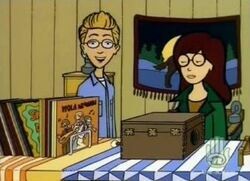 After Ted's parents, Leslie DeWitt and Grant Clinton, visit Jake and Helen to complain about Daria's "bad" influence on their son, Jake and Helen refer to the two of them as "hippies" in a derogatory manner. This attitude is in contrast with their behavior in That Was Then, This Is Dumb, only two episodes before, where they find themselves missing their own hippie days when visited by old friends who were still hippies. This is the first episode where Daria tries to date someone she has interest in, and without the emotional baggage that she had with Tom Sloane. Very few fanfics have ever presented Daria and Ted becoming a couple, however. Daria and Ted are targeted for harassment by Kevin, the Fashion Club, and Robert and his friends. 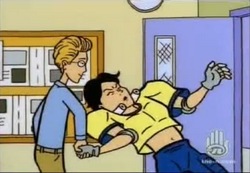 While Kevin and the Fashion Club's plan is to stand there being annoying and Robert's unsure why he needs to harass Daria and the gang end up befriending Ted, this is the only time in the show that bullying rears its head. Mr Fun's Exciting World of Games is an incredible place, having an immersive virtual reality combat simulator in a suburban town in 1998! Whoa! In the scene immediately after her first meeting Ted, where he said Daria's photographs remind him of Goya's paintings, Daria is shown in Jane's room reading a monograph on Goya. In a subsequent scene, Daria is shown in her room reading Shakespeare's Romeo and Juliet while Quinn complains to her of the new yearbook policy to reduce the pages allotted for sports and clubs. Ted appears in Wouter Jaegers' Dariarotica comic "Daria joins the triple cross club" where she mentions him as one of three men that really caught her fancy, saying that it was Ted's intellect that made him attractive to her rather than his looks. The scene where Ted and Daria first meet is featured in Jim North's "DeWitt," a Dexter crossover where Ted is a serial killer. This page was last edited on 16 January 2019, at 06:50.